A masterpiece, not to be missed!! One of the funniest films ever made. "Beautiful California Orange Ranch...ah....I've got my heart set on this thing and I'm going through with it!" This is my favorite comedy movie and that's saying something. I love comedy and comedians. This movie is in a category of its own. I first saw this movie with my cousin Walter Gabrielson in 1969 when it played on one of the late show channels, probably KHJ, in Los Angeles on a Saturday night. I laughed so hard I missed half the movie. Fields plays Harold Bissonette, henpecked husband, struggling corner grocery store owner, and disrespected father who awaits fate to lift him out of the painful banality of his life. Fate arrives with an inheritance from the passing of his Uncle Bean. It is his ticket to California where the state motto is "Eureaka! I've Found it." He takes a chance on it. California was the glamorous destination of the 1930's. My mother told me of listening late at night on my Grandfather's farm to the radio shows coming from Hollywood night clubs and imagining dancing with glamorous leading men. Bobby Short's "Get your Kicks on Route 66" was the anthem. John Steinbeck gave it literary respectability when he wrote "The Grapes of Wrath" about the Okies piling their jalopies with worldly goods and going to California. Harold Bissonette's eight seater looks much like those jalopies. Into this story line are plugged the W.C.Fields comic masterpieces that he had been honing for many years. Here they reach perfection. The Breakfast scene, the Mr. Muckle scene, the "cumquats" exchange, the "phone call to/from the maternity ward" scene, the sleeping porch scene, which reaches it climax with the "Carl LaFong" exchange. Then, there is the whole sequence of the Orange Ranch disappointment turned into success by accident. Rare is the film that is both a period piece and yet an eternal verity. Fields is obviously the star with top billing, but it is a mistake to think that he could do this alone. Fields had an ensemble troop that he played his comedy off and they were essential to his work. In this movie, he had Baby LeRoy, Tammany Young, Charles Sellon (Mr. Muckle), T. Roy Barnes (Insurance agent inquiring about Carl La Fong), and Morgan Wallace playing Fitzmuller who wants the cumquats. Last but certainly not least is Kathleen Howard who is brilliant as Amelia Bissonette. When she says, "I have no maid....probably never shall." Her disappointment in Harold is biting. When, upon seeing the ranch house in California, she proclaims "Ranch house!!! It's a SHACK!" Her voice penetrates directly into the skull and delivers a jolt to the top of the spine. She was underrated to say the least. Norman McLeod was a primer comedy director who worked with the Who's Who of comedy actors. This is one of the most hilarious movies ever made, and one of the least-known and appreciated. W.C. Field is outstanding as the California grocer, Mr. Bissonette, who has inherited an orange grove. The funniest scene is when a blind man comes into his store and breaks everything with his cane, while Bissonette stands my helplessly. You will be on the floor in stitches! "Go West , Old Man"
The Funniest Movie Ever Made "It's a G ift" W.C. Fields, et al. This is without the slightest doubt the funniest movie ever made. Every time I've watched it, which is about 8-10 times, I end up on the floor, barely able to breathe, and I don't drink, nor do I have any pulmonary problems. The scene with the coconut bouncing down the stairs in a perfectly timed rhythm is one of the funniest (I don't know how they did it), and one of my other favorite scenes involves the insurance peddler looking for Karl Lafong, not to mention the scene in which the man wants to buy cumquats, and Fields asks "How many quats?" There are too many funny bits in this film to mention, which means you may very well laugh yourself to death. There are lesser fates. Fields, who wrote the script under the pseudonym of Charles Bogle (he has a genius for comic names almost equaling Dickens), plays greengrocer Harold Bissonette (pronounced Bissonay! ), long-suffering henpecked husband and father. His wife nags him, his daughter treats him like a bathroom fixture to be moved out of the way, and his son, who nearly kills his father by leaving a stray roller skate lying around has the cheek to ask "What's the matter, Pop? Don't you love me anymore?" I leave it to you to imagine the reaction of the man who once said that one should never share a stage with children or animals. In this movie, there are two children, but no animals. What this poor man heroically deals with is quite enough for anyone's endurance, so when he decides to sell his business and move to a California "orange ranch" or grove, we've long since been on his side, cheering him along. Even the cumquat man says "More power to you" as the long-suffering Harold tries to crank start his Model A. 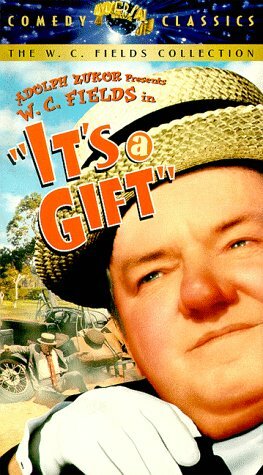 A masterpiece of comic timing, both in script and in acting and directing, "It's a Gift" is a gift to us all. Show it to your children, and it'll make better people of them. Perhaps not, but you can try, and by trying, you'll be enjoying the funniest movie of all time. In these trying times, the gift of laughter is the best of all, and that's the best reason to get this DVD as soon as possible. (It's part of a collection of other Fields masterpieces). How many times have I told you never to call me Mr. Bisonette in front of Mrs. Bisonette, It's pronounced Biso-nayh! "Next, They'll Probably Give Me A Velocipede..."
If you are young at heart, the dreams can come true! The memorable lesson of will and encouraging self determination of a man who is living the winter of his existence, alienated and disappointed with the members of his family, have become this film a real cult movie since its immediate release. After the recent turmoil of the Great Depression and the countless financial failures and spiritual wounds left behind, this film emerged like a brave message about you or me can be able to do , albeit the most adverse circumstances. The rest of the anecdote runs for you. Watch and delight this surprising and smart film, a legitimate lesson of life, even for the actual and next generations to come. A wise advise:Release it in DVd and Blue Ray format, it would be pleased for many, many people. "Sit down Mr. Muckle, sit down honey." "WHERE ARE MY KUMQUATS???!!!" This perfect comedy is, for my money, the funniest film W.C. Fields ever made, and that's not faint praise. Small town grocer Harold Bissonette takes his family to California when his Uncle "Bean" dies and he inherits an orange grove. This road trip comes sometime past the halfway point of the picture. And what has taken up the first half? Just some of the funniest set pieces Fields ever devised. First there is his harrassed home life, put-upon by everyone from his shrewish wife to his son Norman's errant and deadly rollerskates. Then there is his harried working life with the furiously impatient customer yelling for his kumquats while Fields attempts to keep the blind Mr. Muckle from destroying every light bulb in his stock with no help from his numbskull assistant whom he doesn't hesitate to abuse. (I read that Fields put in the Mr. Muckle bit to answer a dare that he couldn't find humor in a disabled character...well he did and it is a classic). Then there is the long piece of Fields trying to sleep on the porch beset by rolling coconuts and wood staircases, loud whiny neighbors, shouting vegetable vendors, and the obnoxious annuity salesman looking for the elusive Mr. Lafong "the railroad'n man". The mounting frustration,including Baby Leroy trying to skewer him with an icepick, is a classic exercise in the slow building of comedic bits, one on another, to capture the perfect portrait of utter irritation. And finally there is the road trip where Fields shows his put-upon everyman to be just as boorish as anyone as he and his family trash an estate and carry on like rubes.